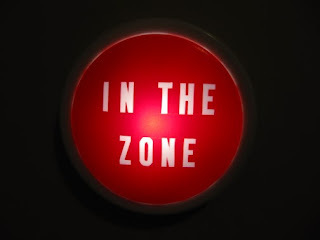 Daily Dumbbells: "In the Zone"
Its been a long time since I have written a blog and lately it seems every one I run into ask me why? There was a time a few years ago when I could write everyday and I felt as though I was primarily helping myself and along the way, hopefully helping others that were feeling the same way. After a while, my thoughts stopped flowing and I felt as if though what I was writing, might be taken the wrong way. I felt like people may misconstrue what I was writing and believe that somehow I felt I had all the answers or that my life was "perfect". Instead of just writing as I had done before, I started thinking too much about how my writings were being perceived and with that, it all stopped flowing. When athletes talk about being "In the Zone", I believe its similar to how I was writing in the beginning. I was free of others thoughts and or opinions and I was just focused on the task at hand, allowing my thoughts to be transferred to paper. Once you are out of "The Zone" you become distracted by the outside noises and pressures of the game (life) and it can paralyze you. Even as I write this, I find myself thinking of how it will be perceived but in an attempt to get back to doing what was so beneficial to me, I am going to continue to write. Hopefully as I do, I will unknowingly fall back into "The Zone".